Interstate 16 forms an intrastate route joining Macon with Savannah in southern Georgia. The primary purpose of the route is to link I-75 with the Port of Savannah to aid in the movement of goods.2 Connecting with Interstate 95 at Pooler, I-16 also provides part of a high-speed route from Atlanta to the Golden Isles and Jacksonville, Florida. The freeway originates at a directional-T interchange with I-75 at the Ocmulgee River northwest of Downtown Macon. Heading southeast, the freeway serves commuting interests to U.S. 129 (Gray Highway) and U.S. 80 (Coliseum Drive) before quickly leaving the Macon urban area to Lanier Heights near Macon Downtown Airport (MAC). Beyond Macon, Interstate 16 travels a rural course south and east across forested hills in Twiggs County. Forest stands give way to some agricultural fields as the freeway nears the quad point of Bleckley, Laurens, Twiggs and Wilkinson Counties at the town of Allentown. 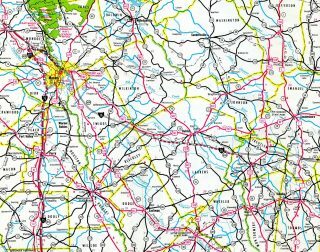 Advancing eastward, I-16 reaches the outskirts of Dublin, the largest city between Macon and Savannah, before crossing the Oconee River. East from the river, I-16 winds through more forest land with generous exit less stretches to the city of Metter. Passing south of there, the freeway remains unchanged in character and design, but across increasing areas of wetlands leading to Chatham County. Suburban expansion adds commuter traffic to Interstate 16 from the Bloomingdale and Pooler areas to the full cloverleaf interchange with Interstate 95. 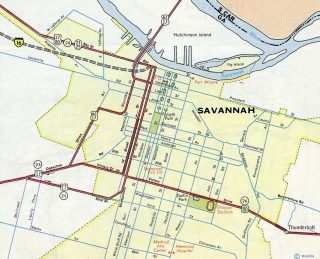 Beyond the busy exchange, I-16 reaches the Savannah city limits, passing by industrial areas to Interstate 516, a north-south spur between Garden City, Hunter Army Airfield and Midtown Savannah. U.S. 17 combines with Interstate 16 beyond I-516 as the freeway makes its final approach to Historic Downtown. Freeway branches from I-16 serve Midtown via Georgia 204 (37th Street Connector) and Hutchinson Island via U.S. 17 & Georgia 404 Spur north to the Talmadge Bridge. The easternmost segment of formerly transcontinental U.S. 80 follows the Interstate 16 corridor between Macon and Savannah. U.S. 129 Alternate also parallels the freeway south from Lanier Heights outside Macon to Bullard, while the easternmost portion doubles as U.S. 17. Work to rebuild the 1962 interchange at Interstate 16’s west end is slated for construction between fall 2016 and 2024. The six-phase project was first studied in the early 1980s with preliminary engineering in 1998. $380 million in construction4 will shift the left-hand ramps from I-75 south to I-16 east and from I-16 west to I-75 south to right-hand ramps. Collector distributor roadways will be added including along I-75 south from I-16 to U.S. 41 & GA 19 (Hardeman Avenue / Forsyth Street) and on both sides of I-16 to Exits 1 and 2. Details of the project can be found at the GaDOT I-16/I-75 Improvement Project web site. 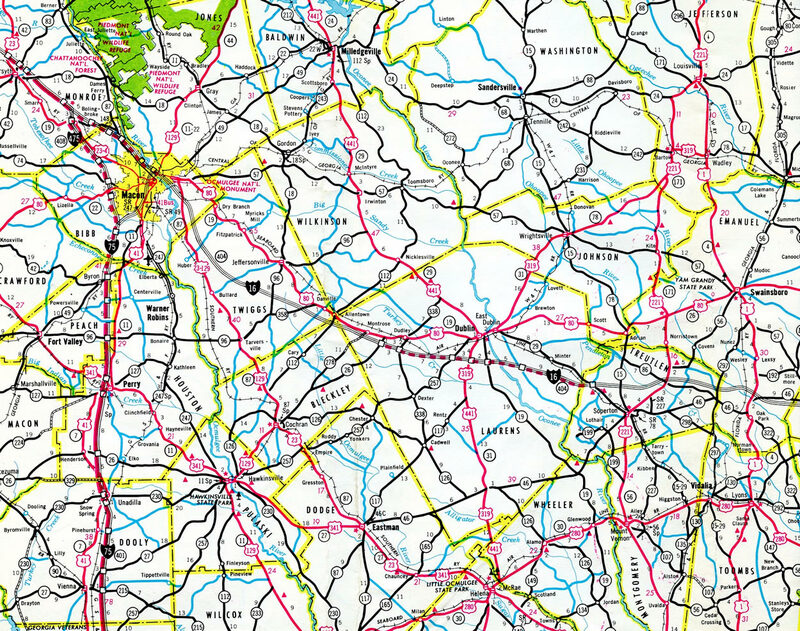 The 1962 Rand McNally North American Road Atlas showed Interstate 16 proposed on an alignment close to U.S. 80. This alignment was shown to at least the 1964 edition. 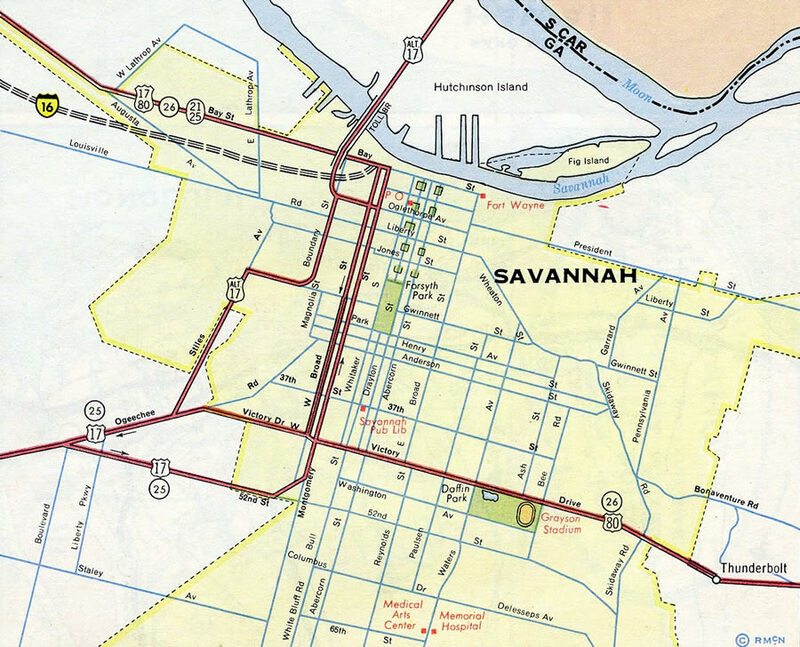 Two alternatives are being studied by the Savannah Planning Commission for the removal of the Interstate 16 spur east from U.S. 17 to Montgomery Street and Martin Luther King, Jr. Boulevard in Savannah. These must be submitted to the FHWA and GDOT for final approval. Both call for the dismantling of the freeway lanes and ramps east of U.S. 17 & GA 404 Spur with the addition of two new ramps at the current Georgia 25 Spur partial interchange further north. A boulevard may be built in place of the former I-16, or a new street and wye interchange from I-16. See more on the I-16 Ramp Removal Study here. There are no official plans to extend Interstate 16 further west. Construction of High Priority Corridor 6/Fall Line Freeway, which includes U.S. 80 west from Geneva to Tuskegee, Alabama, involved building a four-lane divided highway at-grade in Georgia. The Fall Line Freeway is already completed west of Macon. It extends east from U.S. 80 at Geneva along Georgia 96 to Georgia 49 Connector west of Fort Valley. Georgia 49C and Georgia 49 extend the Fall Line Freeway northeast to Exit 149 of Interstate 75 at Byron. Interstate 16 east enters its final mile in the city of Savannah. Three options are available at this point. The first is to take Exit 165 for the 37th Street Connector. This route joins Georgia 204 along 37th Street as the state route progresses east to Abercorn Street. Abercorn Street is a busy commercial arterial with anywhere from four to eight lanes from Midtown Savannah to South Side Savannah. Photo taken 11/11/06. Eastbound Interstate 16 splits with Georgia 204 (37th Street Connector) at a wye interchange (Exit 165). Photo taken 11/11/06. Interstate 16 swings northeast to Exit 166, which serves both Gwinnett Street and U.S. 17 & Georgia 404 Spur north to Hutchinson Island. Photo taken 11/11/06. Interstate 16 branches east toward Historic Downtown Savannah as U.S. 17 remains northward along side the Georgia 404 Spur freeway. U.S. 17 & GA 404 Spur wind west of Downtown to the Eugene Talmadge Bridge into Jasper County, South Carolina. Photo taken 11/11/06. The speed limit reduces to 45 miles per hour as Interstate 16 passes through the wye interchange with U.S. 17 & Georgia Spur 404 north. Photo taken 01/03/14. Exit 167B quickly follows for Gaston Street east to Dr. Martin Luther King, Jr. Boulevard. The main lanes continue northward onto Montgomery Street (Exit 167B). Photo taken 11/11/06. A flyover takes I-16 over both Dr. Martin Luther King, Jr. Boulevard and Taylor Street ahead of a left-hand merge with Montgomery Street north. This ramp may be removed in the future. Photo taken 11/11/06. An end shield precedes the transition of the eastbound flyover onto Montgomery Street north. The overpass touches down just ahead of Liberty Street, which becomes Louisville Road one block to the west at Dr. Martin Luther King, Jr. Boulevard. Ahead is the Savannah Civic Center, Historic Downtown and the Savannah College of Art and Design. Photo taken 01/03/14. Two lanes branch away from Martin Luther King, Jr. Boulevard south onto Interstate 16 ahead of the traffic light with Taylor Street. Photo taken 01/03/14. Taylor Street provides westbound access to Interstate 16 from Montgomery Street north beyond this shield assembly. The I-16 junction with Interstate 95 lies ten miles to the west. Photo taken 01/03/14. The easternmost portion of Interstate 16, from Historic Downtown Savannah to Interstate 95, is designated the Jim Gillis Historic Savannah Parkway. The remainder of the freeway west to Macon is James Gillis, Sr. Memorial Highway. Photo taken 01/03/14. The first westbound Interstate 16 shield precedes the merge with U.S. 17 & Georgia 404 Spur west. There are no westbound off-ramps to the Interstate 516 at Exit 164. Photo taken 01/03/14. Lowering from the Eugene Talmadge Bridge, U.S. 17 & Georgia 404 Spur south approach a loop ramp for Georgia 25 Spur (Oglethorpe Avenue) for Downtown Savannah. The freeway defaults onto Interstate 16 west in 1.75 miles. Photo taken 12/21/13. A half diamond interchange adds traffic to U.S. 17 & Georgia 404 Spur south from Louisville Road ahead of the wye interchange here with Interstate 16 west. Photo taken 12/21/13. Interstate 16 west overtakes U.S. 17 & Georgia 404 Spur south as the on-ramp from Gwinnett Street merges from the right. Photo taken 12/21/13. An Interstate 95 trailblazer accompanies this reassurance marker for I-16 west at the Georgia 404 Spur terminus. Photo taken 12/21/13. The final mainline interchange of Interstate 16 west is Exit 1B at Georgia 22 (2nd Street) for Downtown Macon. Georgia 22 ties into U.S. 23, U.S. 129 and Georgia 49 just to the north. Photo taken by Chris Patriarca (07/06/03). The final Interstate 16 west shield assembly stands just after the on-ramps from U.S. 23-129 & Georgia 49. Photo taken 05/28/05. Interstate 16 carries six overall lanes between U.S. 23 & 129 and Exit 1 with Interstate 75 south. Photo taken 05/28/05. End Interstate 16 shields are posted as traffic separates for Interstate 75 north and south. I-75 ventures north from Macon to Forsyth, McDonough and Atlanta while I-75 south takes motorists back toward Downtown Macon en route to Perry, Cordele and Tifton. Photo taken 05/28/05. A new two mile overhead for Interstate 16 was installed as part of the 2010-13 road work to expand I-75 to six lanes from Arkwright Road (Exit 169) south to the Macon city line. Photo taken 07/05/14. Leading south from Exit 167 with Georgia 247 (Pierce Avenue), I-16 parallels U.S. 23 & Georgia 87 on the initial approach to Exit 165 with I-16 east. Photo taken by Chris Patriarca (07/06/03). One mile ahead of the three-wye interchange (Exit 165) with Interstate 16 on I-75 south. The left-hand ramp for Savannah will eventually be shifted to the right. Photo taken 07/05/14. A pair of supplemental guide signs advise motorists of the lane allocation for Interstate 16 east and 75 south as the freeway crosses over a Norfolk Southern Railroad line. Photo taken 07/05/14. A second diagrammatic sign outlines the forthcoming left-hand ramp for Interstate 16. I-16 sees two interchanges across from Downtown Macon before transitioning into a rural freeway for the bulk of the drive east to Savannah. Photo taken 07/05/14. Interstate 75 south at the eastbound beginning of Interstate 16 (Jim L. Gillis Highway). The I-75 control city of Valdosta is 150 miles to the south. Photo taken 07/05/14. This set of overheads for Exit 165 with I-16 were eventually replaced by a diagrammatic sign. Macon was displayed as a control point for I-75, even though the freeway had already entered the city limits by this point. Photo taken by Chris Patriarca (07/06/03). Replaced overhead posted a half mile ahead of Exit 165. Interstate 16 continues the southeasterly trajectory of I-75 along the Ocmulgee River as Interstate 75 turns to the west of Downtown Macon. Photo taken by Chris Patriarca (07/06/03). The two-mile guide sign for Exit 165 and Interstate 16 east, is posted on the Georgia 74 (Mercer University Drive) overpass. The Downtown area of Macon is served by three Interstate 75 interchanges ahead of I-16. Photo taken 11/07/14. Interstate 75 travels one mile north from a split diamond interchange with U.S. 41 Business (Forsyth Street / Hardeman Avenue) to meet Interstate 16 east. Photo taken 11/07/14. Interstate 75, from the Walnut Street overpass northward, descends into the Ocmulgee River valley and the three-wye interchange (Exit 165) with Interstate 16. I-16 connects Macon with the city of Savannah along Georgia&apos;s Gold Coast in 165 miles. Photo taken 11/07/14. U.S. 23 & Georgia 87 (Riverside Drive) span Interstate 75 as the freeway separates with the two-lane ramp for Interstate 16 east. The first three interchanges of I-16 serve the city of Macon and connect with a myriad of U.S. and state routes leading north from Downtown. Photo taken 11/07/14. "I-16/I-75 Interchange construction to start fall 2016." 13WMAZ, November 12, 2015. Page updated November 13, 2015.